Yes, my spinning fiber stash just keeps getting bigger, in spite of my efforts to keep it under control by spinning, spinning, and spinning. I’m not ready to give up any of my fiber clubs quite yet, so I will just have to find room for all the fiber. Of course, every time I complete a spinning project, my fiber stash gets a little smaller, but my yarn stash gets bigger. And so it goes grows. I’ve started spinning one bump of this lovely superwash Merino from Into The Whirled in the colorway Godric’s Hollow. I split the bump in half vertically and I am spinning each half end to end onto one bobbin. I plan to chain ply the singles to make a self-striping yarn. I split the bump so that the color repeats (stripes) would be small. These two braids are the December 2015 installment of the Sweet Georgia Yarns Fibre Club. The colorway is called Wistmas. Wistmas is on a base of BFL, and I decided to do a fractal spin. This bobbin contains the singles spun from the braid that I split into 12 strips vertically. I spun the other braid end to end without splitting. The plying is almost done. Because I spun two bumps, approximately 200 grams, of fiber, I filled one bobbin and had to start on a second bobbin. This is a straight-up 2-ply yarn, and the second bobbin is about 2/3s done. I love the sheen of BFL. It’s been a while since I did a Finished Object Friday blog entry. Is it like riding a bike? Let’s start with this lovely skein of chain-plied Falkland from Bee Mice Elf. 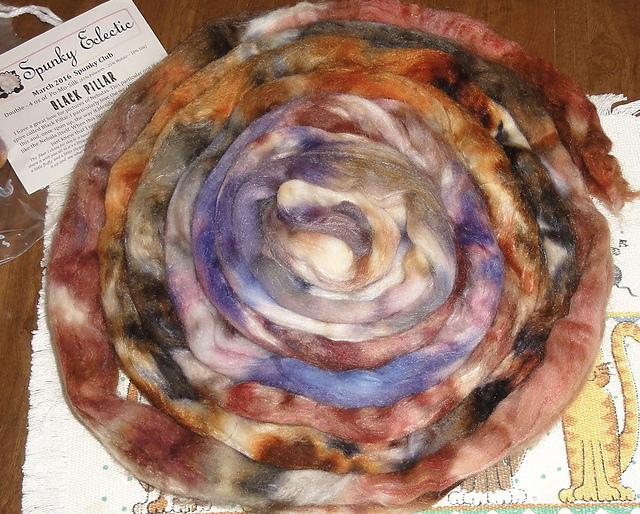 The colorway is Winter 2015 from the fiber club. Spun in double drive, chain plied in Irish tension on my Ladybug. 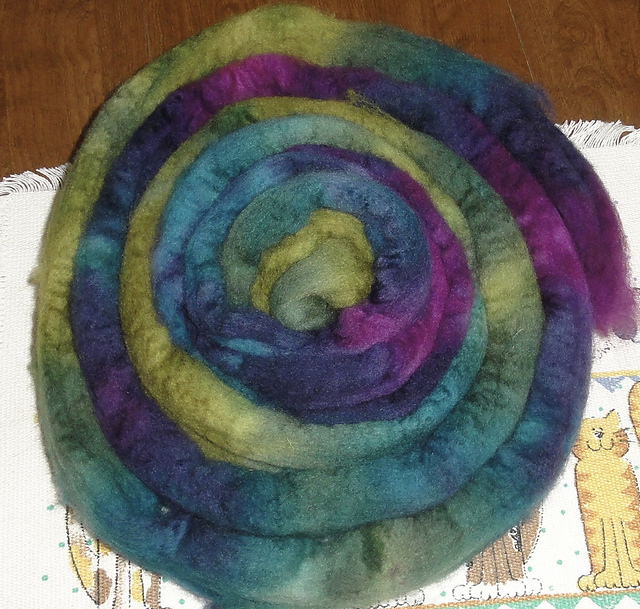 I spun this using a technique I learned from Felicia Lo’s Craftsy class, Spinning Dyed Fibers. 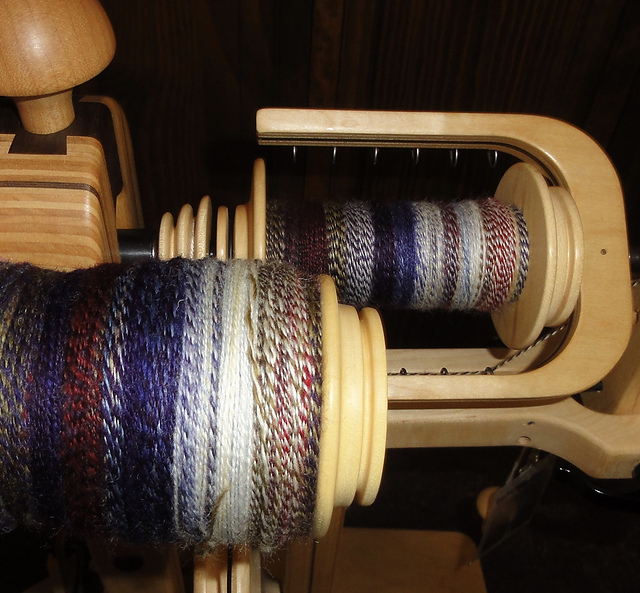 I split the braid lengthwise repeatedly into thin strips, then spun them end to end, keeping the colors in the same sequence, and then I chain plied the singles. This creates a striping yarn with shorter color repeats. 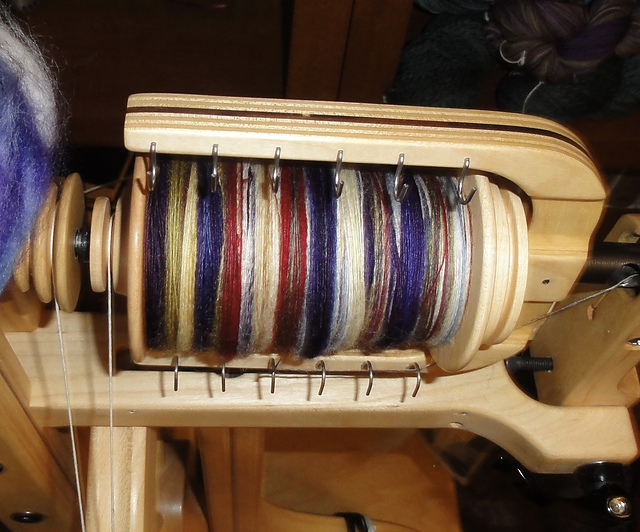 As you can see from the picture, there is a little more color mixing than you normally see in chain-plied handspun. This yarn is destined to become fingerless mitts. I have another bump of this colorway, which I spun using a different technique, and which will become a matching hat, but the skein isn’t quite finished yet, so no picture yet. Sorry. My other FO is a skein spun from Masham, dyed by Spunky Eclectic in a colorway called Verdigris. Another chain-plied yarn spun in double drive and plied in Irish tension on my Ladybug. I spun this using a “fractal” technique described by Benjamin Krudwig on the Schacht Spindle Blog. It’s quite different from the standard fractal spin because it keeps the colors separate but causes the color repeats to become progressively shorter. With the standard fractal spin, which is a 2-ply, the colors are blended in a way that results in a subtle striping effect. I think of all the colorways I’ve spun since I first picked up a spindle in June of 2012, Verdigris is my very favorite. 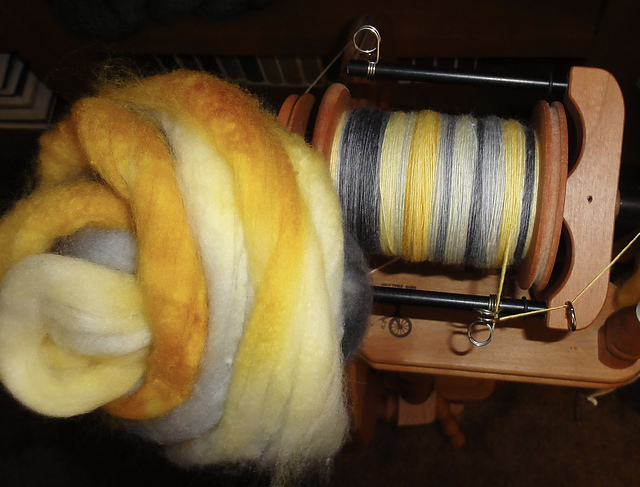 I also enjoyed spinning the Masham wool. I had never spun it before, but I will most certainly spin it again. It’s very similar to Shetland and would not be next-to-skin soft for many people. But I think to would make a great cowl or fingerless mitts or socks. I also have another bump of Verdigris which has also been spun and plied, but quite differently from Skein #1. When it’s finished, I’ll photograph the two skeins side by side so that you can see just how different they look. 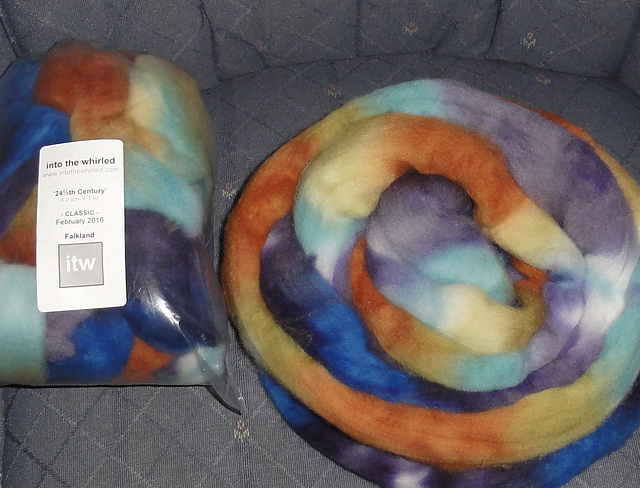 You might find it hard to believe they were spun from the same colorway.